Here’s one of many apps of this stacking style. I liked the colourful nature of this one and the monster theme. All you have to do is choose where to drop your monster blocks and make sure it balances for at least the defined time. 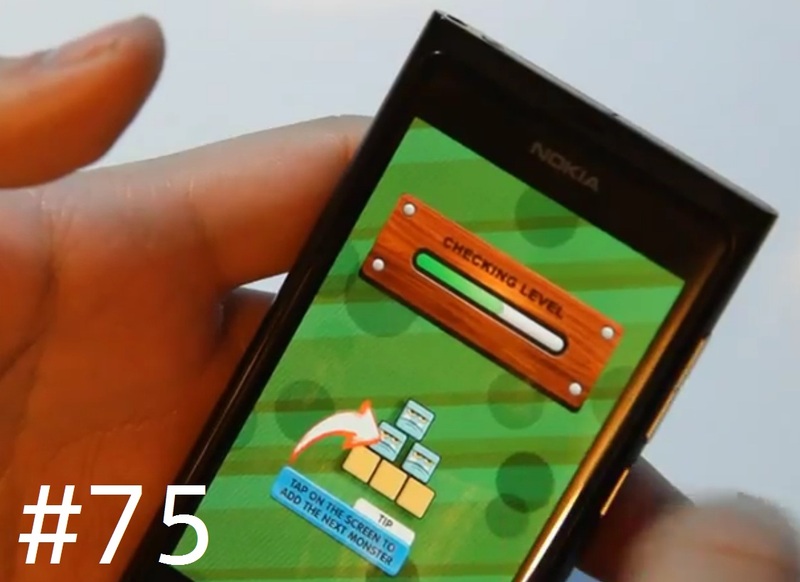 There are other game modes in addition to going through the levels which make the stacking a little harder. There’s one for the N9 similar to this (I’d say actually nicer in a few ways) which I’ll be recording and demoing this week. First bonus pack is here! 15 additional levels for a total of 40. Be one of the first people in the world to unlock the new “Big Bonus” achievement for completing the pack. Achievements are here! Be one of the first people in the world to experience the all new Health Pack Network exclusive for all of our games. Next update will feature an additional 25 levels. Another Mango update is here! Using new 60 fps physics engine for smoother gameplayer. Achievements and additional level pack is coming in the next update. A brand new monster adventure! Monsters just want to be together, help unite them. A fun, creative physics based game where you stack monsters on top of each other. 25 Unique levels in the first level pack with more to come in the future! – Design your own level with the included level editor and find new ways to solve levels. – A funky background that is dynamically generated.